Available storage capacity in the Teradata Data warehouse is a valuable and expensive asset. Optimizing tables in Data Warehouse not only brings about huge space savings, but also improves the overall performance of the queries using them. So in conclusion, it saves both time and money. But where is the catch? This process is quite time-consuming and requires experienced resources. But not with ATO! Statistics based on practical experience show that using ATO can reduce capacity requirements, on average, by 40% while saving three days of effort of an experienced developer per table! ATO (Automated Table Optimizer) is a lightweight but handy and robust standalone application running on Windows platform, which connects to the Teradata DWH and analyzes existing DDL structures. 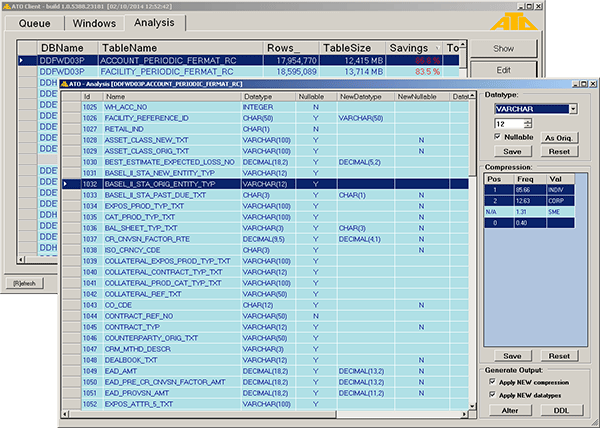 It consists of 2 main parts: ATO Client and ATO Analyzer. The Analyzer is a powerful backend, which scans tables in the data warehouse and based on the results of its analysis, it generates recommendations on how to improve them. The Client provides an intuitive user interface that allows user to configure the Analyzer, review its findings and suggestions for improvements, and generate the deployment scripts for the actual implementation of the change. The key is to get the most out of the performance when the Data Warehouse is quiet in order to avoid negative impact on ETL batch and user queries (i.e. run on evenings, weekends, etc.). Using sampling, the ATO can do a quick scan of the whole Warehouse and identify the suitable candidates. The troublemakers are further investigated and the ATO will create an accurate series of recommendations to reduce size and improve performance of each table. Knowing how much space you can save on each table helps you focus on the bad ones first and ultimately decide which candidates are worthwhile spending the time. Implementing table improvements have never been so easy. Simply generate all the scripts to deploy selected changes with a click of a button! The well-arranged user interface of the ATO Client allows you to easily assess the current status of the data warehouse, view and amend suggested changes and simply get the space management under your control. Tested on TD14 - it works! After running successfully on the Teradata 13.10 for over 3 months, ATO did another important step on the way to becoming a solution of the future for DWH optimizations. Teradata 14 is no challenge for the ATO and it runs even faster! After a series of successful presentations and evaluation of valuable feedback, new design and interface has been introduced and ATO version 1.0 is here!